I learned about an inaugural triathlon while having lunch at Tutu’s Soup Hale. I thought it would be excellent to cover the first triathlon on Kauai and dreamed of submitting it to Triathlon magazine and Senior Living because the man putting it on was 65 and competing in the duathlon. Sunday morning we woke at five and got to the Marriott by six. Dan had a wonderful time shooting the competitors, who were pretty much all men, and mostly locals. 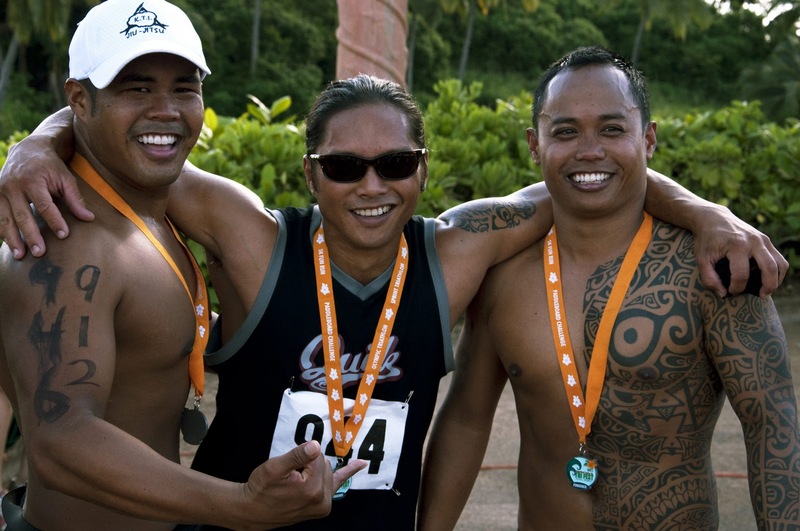 He quickly garnered their respect and was happy to be included in their ohana when the title bruddah was addressed to him. I, on the other hand, had a difficult time getting any useable information form the founders wife. She spoke on and on of the minute and in consequential details of their lives that only they and maybe family would care about with a tendency toward exaggeration. “Oh, my lord yes,” she said in a Texas accent, “he has competed in triathlons for years. 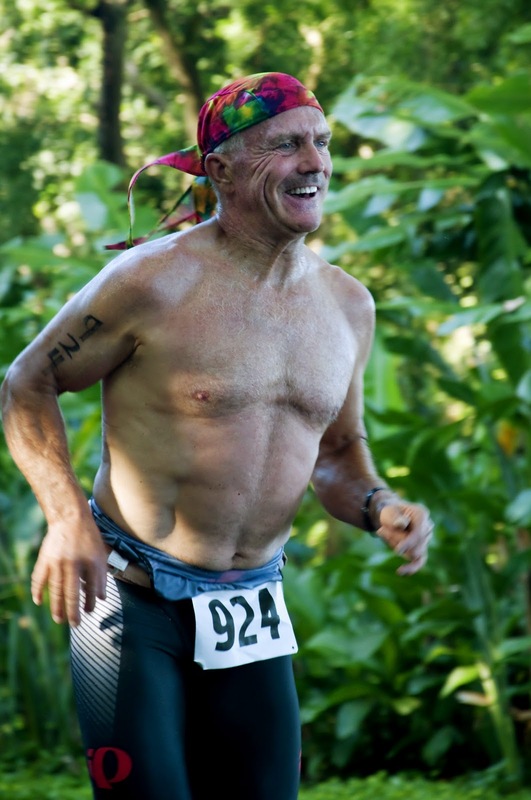 At one point he did one every month.” “Triathlons?” I asked shocked of the possibility. “Oh well, you know 5k’s, 10ks, relay duathlons.” Totally different, but I could use that information. 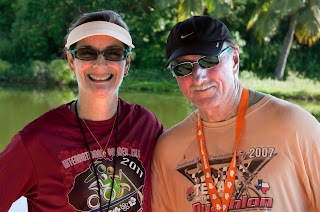 Her husband, having finished running 4k of the relay duathlon (his partner rode his bike for 20k), didn’t have much to say. 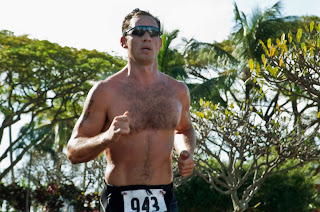 I got to interview one triathlete who gave thoughtful answers to my questions and I began to think I might have something. The athletes were frustrated because the course was not well marked and many of them ran farther than they had to, rendering their time useless and the event as an extended form of exercise. 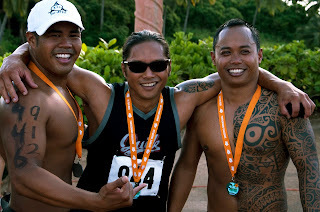 I also found out there were two other triathlons on Kauai. The first and second place winners, local boys, were modest and didn’t feel comfortable talking about their success. I learned a lot of lessons that day but the futility of it set me into s slump. I tried to ignore it, push down feelings of failure. I wrote a post for the travel blog and submitted an article for the local paper. I have not heard from the paper. Tears of frustration welled in my eyes as we sat in a restaurant I frequent, who I have done a restaurant review for, whose owners I know. Embarrassed, I looked toward the door as she got me a napkin. So, I am on reconnaissance. Her words rang true. I am flat out depressed. I know the only way out is in. I have to wander the murky depths of my sadness and release those negative feelings. The next day I laid on the couch, in a fetal position, curled into the dogs and cried. Napped and cried some more. When Dan came home he listened and decided Christena was right. I had permission to be sad and sit with that sadness. He didn’t judge me for it, try to make light of it or change what it was in any way. I love him for that gift. Thursday Dan went to the North shore to give two computer classes, one was for Christena. She is an avid reader, a former English teacher and a writer. She had given Dan three books for me to read. I spoke with my friend Deb on the phone and soon we were laughing. She is having a rough go at life and I admire her will to keep pushing forward and her ability to laugh at it all. Friday morning I felt heavy again, weighed down with sadness. After Dan left for work I curled up on the bed with Baxter and Lucy and cried myself to sleep. The phone woke me. I listened to the message. It was someone who wanted me to do a restaurant review. I called him back and easily put on my game face. He was energetic vibration was very high. A happy EMT, restauranteur, husband and father. We spoke for 30 minutes and by the end of the conversation I was lifted. I started to slip into a slump so after I meditated I cracked open Christena’s book Prosperity Pie, How to Relax About Money and Everything. Four hours later I had finished the book and took a nap. I woke feeling lighter. Saturday, I worked on the book some, answering questions. The first assignment was to list all of my worries, anxieties and fears and take a break from it. After the break, I would answer the questions like I would for a best friend. I was feeling tired from it after eight (out of 33!) and decided to read a book for fun. I’m happy to say it’s working. I feel much better though I am not raring to put myself out there again, yet. Christena suggested I go to community college. I have wanted to get a degree for years. The other day Dan suggested I do the same. I told her I could only get a two year associates degree so it wasn’t really worth it. She replied that it was better than nothing and I could always finish up online. I am in love with this idea, the thought of it gets me excited. So, this week I am going to go down there and apply for the English 100 Composition1 course. After spending $500 bucks (!) on the dogs Monday, we don’t have the money for it. But, mom called earlier today and said her and dad felt like sending $200 I love you bucks so it’ll only cost us $48! I am definitely wealthy in love and friendships! Casey said this guys is the fastest triathlete on Kauai!